The largest mountaintop removal project in West Virginia history is nearing the finish line of a four-year race. But the southern West Virginia Spruce No. 1 mine proposal might be back at the starting gate if the U.S. Environmental Protection Agency (EPA) does not approve its permit. This mountaintop removal project is especially contentious because of its size. Waste from the mine could bury more than 10 miles of West Virginia mountain headwater streams, far more than most surface mines. Mountaintop removal is defined as mining that uncovers coal seams by digging soil and rock from the tops of mountains, according to the West Virginia Department of Environmental Protection (WVDEP). The removed mountaintop is then placed in nearby hollows and valleys, creating "valley fill," which buries streams and can, as a result, disturb or displace fish and wildlife and cause related environmental problems. Mountaintop removal, which accounts for nearly one-third of coal extraction in West Virginia, may have a tough road ahead. A May federal court ruling by Chief U.S. District Judge Charles H. Haden II states that the Clean Water Act - the regulation under which all permits for new mines are issued - does not allow coal operators to bury streams with valley fill. The ruling further states that approval of waste disposal as valley fill material from mining is "beyond the authority of either administrative agency, the Corps [Army Corps of Engineers] or the EPA." Furthermore, Judge Haden forbade the Corps from issuing permits that did not have a "primary constructive purpose" for the fill. The Bush administration and several members of the coal industry have filed briefs appealing this ruling to the Fourth Circuit Court, where a verdict has not yet been rendered. Right: Mountaintop removal. 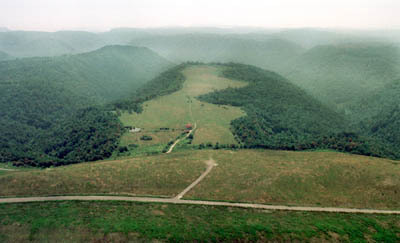 This flat plateau along Cannelton Hollow in Fayette County was the site of the first mountaintop removal in West Virginia. Called Bullpush Mountain, the area is now a flat, grassy meadow that stands out among the wooded hills. Photo by Kenny Kemp, courtesy of the Charleston Gazette. If not overturned, Judge Haden's ruling could have serious ramifications for the future of mining in West Virginia. More specifically, according to an economic analysis by three professors at Marshall University's Center for Business and Economic Research, over the next five years, annual coal production rates could decline by as much as 9 to 12 percent; more than 15,500 jobs would be lost in West Virginia alone; and the state would be down almost $700 million. "We are deeply concerned about the impact of this ruling on the well-being of the people of Central Appalachia, the potential effect on the overall economy of the region and the region's role as a major supplier of electricity for homes and businesses in the East," National Mining Association President Jack Girard said in a statement. The economic analysis further states that if Judge Haden's ruling prohibits all future valley fills (it has not yet been fully interpreted), it will effectively end surface mining in West Virginia. Further permits, including a permit for Spruce No. 1, will likely not be issued. The EPA has reviewed a draft Environmental Impact Statement (EIS) that the U.S. Army Corps of Engineers (Corps) submitted detailing the potential environmental impacts of the Spruce mountaintop mining project. The EPA found the EIS to have serious "gaps in its analysis of the proposed Spruce No. 1 mine and related environmental impacts," as stated in a letter from EPA Region III Administrator Donald S. Welsh to the Corps. If the statement is not resubmitted with satisfactory information, the agency stands to effectively block the permit application for the mine, separately from Haden's ruling. Facing an even tougher road ahead, Hobet Mining Inc., a subsidiary of St. Louis based Arch Coal Inc., has been diligently seeking approval for this 3,100-acre mountaintop removal mine since an initial permit request in 1998. In January 1999, the Corps proposed approval of the permit but by June had withdrawn its proposed approval due to a lawsuit brought by the West Virginia Highlands Conservancy and a group of coalfield residents over the Clean Water Act. Several lawsuits and many decisions later, the Corps stands ready once again to approve the permit for this mine. The EPA, along with the Corps, the Office of Surface Mining (OSM), the U.S. Fish and Wildlife Service, and the WVDEP, review permits for mountaintop removal projects prior to approval. The OSM and WVDEP are the first agencies to approve or deny a permit. "Currently, if approved, the coal operator submits an application to the Corps that must include a statement of potential adverse environmental impacts, types and names of streams potentially impacted, the acreage impacted, full engineering plans and so on," says Steve Wright with the Corps. From there, he says, the Corps evaluates the possible environmental impacts of valley fills. If the Corps considers those impacts minimal, it will usually approve the permit; but if the impact could be significant, the Corps calls for a lengthy EIS, and the Fish and Wildlife Service, EPA and the public can become involved, he says. Such is the case with the Spruce No. 1 proposal. While Judge Haden's ruling may seem like a hammer coming down on the coal industry, it is in a sense holding the permitting regulators accountable to laws already in place, Wright adds. Congress passed the federal Surface Mining Control and Reclamation Act (SMCRA) in 1977 to make operators submit development plans and agree to rebuild a mountain after mining. That fell by the wayside as mine operators saw the difficulty of rebuilding the mountains, and regulations were muddied by various court decisions. For instance, there is no definition of "development plans" in place for regulators to enforce. There is also only a rough sketch of what the mountain rebuilding should entail. As is occurring now due to Haden's ruling, the permit applicant must convince permitters that valley fills are more than simply a convenient waste dump and have a "constructive purpose" as required under SMCRA. Constructive purpose could include industrial, commercial, agricultural, residential, recreational or public facility use. Permits would also be more in line with the SMCRA rule that coal operators make the strip-mined land closely resemble the general surface configuration of the land prior to mining. Such loose definitions of constructive purpose, valley fills and mountain rebuilding, have made it challenging to enforce the regulations. "Lawsuits and court decisions actually help the Corps," Wright says. "As a permitting agency, it helps to have stricter guidelines. We're hoping that comes out of this latest suit." As to the future of the Spruce No. 1 mine, no one can say with certainty. In Welsh's letter to the Corps, he states, "the EPA remains committed to working with the Corps, the state and the applicant to identify and develop an environmentally acceptable project." Some issues still need resolution before the EPA and the Corps will add their stamps of approval on the permit. Of major concern is the issue raised in the current court appeal - Hobet does not include a "constructive purpose" future-use of the mined land. Right now, nothing will be approved without a viable future-use development plan. "It is unclear how the Court's ruling may affect the Spruce No. 1 mine," says Kim Link, an Arch Coal spokeswoman. "But we remain confident that the issues are resolvable and will continue working closely with the Corps and the EPA to address the current issues." And of course, there are always the residents to consider. The many letters to the editor in local papers reveal just how divisive this topic is. "Mountaintop removal mining in Appalachia is an emotionally charged issue where there is no middle ground," Wright says. "It seriously affects the economy and the environment. People are either strongly for or strongly against it, and both sides are interested to see what happens." Read award-winning articles about this subject in the Charleston Gazette.